Canceled – But Rated High? Shows Returning in June. How is that possible? Well it happens all the time, especially in that golden 18-49 demographic. 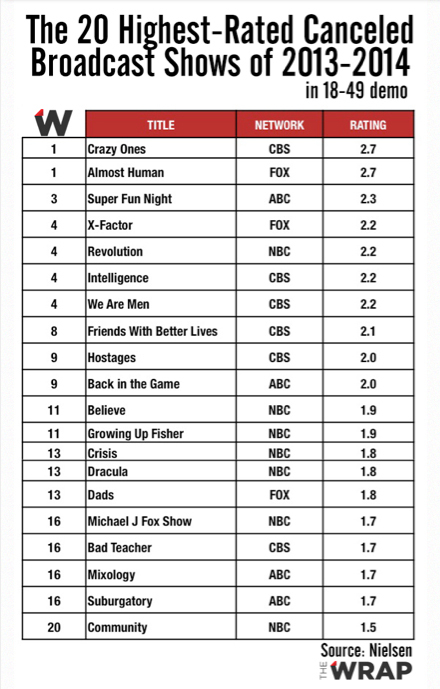 Here is a chart of the 20 highest rated but canceled broadcast shows of 2013-2014 in that magic 18-49 demographic. Robin Williams return to the small screen brought some bittersweet ratings. His show Crazy Ones was number 1 on the list with a 2.7 rating in the key 18-49 demographic, but it was still canceled. It tied with FOX’s Almost Human which took up space on my DVR and I never watched a single episode. I usually watch anything with Karl Urban in it. Oh well. But that 18-49 demo isn’t all that it’s cracked up to be. For example, FOX’s Bones‘ runs around a 2.4 but it’s an enduring show that has proven its value to the network. The Mentalist on CBS is another show earning a 2.0 but it also survived the cut. So it’s easy to say that numbers aren’t the only thing taken into consideration when shows are on the chopping block. Some canceled shows I know of include Once Upon a Time in Wonderland and Mind Games (ABC) and Greg Kinnear’s Rake (FOX) which seemed to end before it even began. On Demand is a wonderful thing. If you still aren’t DVRing yet, then you should add a DVR to your Christmas list, get it installed quick and start reading up on the most effective way to use it. My favorite all time satellite service – DirecTV – has some of THE best high tech toys around, and their On Demand service is so simple to use, my Chiweenie could operate it. USA Network is Ch. 242. The On Demand channel is 1242. How easy is that? You just throw a 1 (one) in front of the channel and you have the On Demand channel number. Today while I was watching a marathon of N.C.I.S. on USA Network (another one of my favorite shows) I saw a commercial for Suits. I loved that show from the pilot. I only saw Patrick J. Adams, who plays Mike Ross, in Suits in one other show, and that happened to be an episode of N.C.I.S. The commercial which pulls this all together said that the first two seasons of Suits is available on On Demand. Sure enough, I grabbed my DirecTV remote and drove to the On Demand screen, found Ch. 1242 which is the USA Network and saw all the episodes of the first two seasons of Suits, just waiting for me to download them and watch them. And, I just might, because there are some quality actors in Suits. In addition to Patrick J. Adams (Mike Ross), he is joined by Gabriel Macht (Harvey Specter), Rick Hoffman (Louis Litt), Meghan Markle (Rachel Zane), Sarah Rafferty (Donna Paulsen) and Gina Torres (Jessica Pearson). As the pilot began, Mike Ross is a brilliant college dropout with an eidetic memory who makes a living taking the LSATs for others. Mike also sells marijuana on the side to supplement his income and to keep his grandmother in a private nursing home. When he agrees to deliver a large quantity of marijuana for his best friend Trevor he finds out the delivery is actually a sting operation and escapes the police by accidentally sitting for an interview with Harvey Specter, one of NYC’s top corporate lawyers. Harvey is impressed with Mike’s quick wit, encyclopedic knowledge of law, and desire to be an attorney. He hires Mike and pretends that Mike is a Harvard Law graduate. Only Harvey’s legal secretary and confidant Donna knows the truth, but as the first season ends and the second season begins, Mike’s secret is in jeopardy and so is the life he’s built for himself and his grandmother. Season 2 was a total knockout of what I expected it would be, and I can’t wait for the final 6 episodes. It’s a great series created by Aaron Korsh. Season 1 consisted of 12 episodes. Season 2 was split with 10 episodes with the mid-season finale on August of 2012 and the remaining 6 episodes will air beginning January 17. In October of 2012, USA Network ordered a third season (16 episodes). There’s a great song called “Greenback Boogie” by Ima Robot that always ends up sticking in my head for at least 3 hours afterward. It’s one of those songs that you screw up the lyrics really bad and something totally funny comes out instead of what they’re really saying. If you’re looking for some quality TV, which is what I write about, then On Demand the first two Seasons of Suits and get ready for the last 6 episodes of Season 2 starting Monday, Jan. 17.